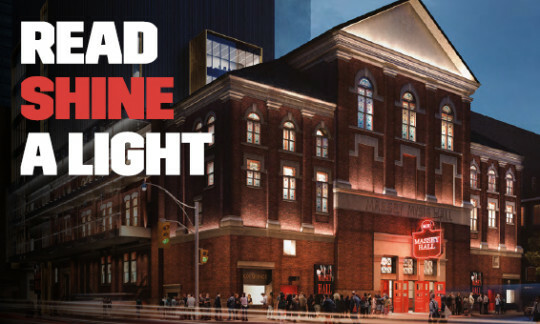 Massey Hall is about to diversify––in some compelling ways. For 123 years, it has been a space for people from all walks of life to experience live performances in an elegant, historic setting. This year alone has seen a wide range, from Wilco to Blue Rodeo’s double-date with the Sadies, from rock goddess PJ Harvey to comedian Ricky Gervais. While acts from roots to pop to comedy are well-represented on the calendar, livelier dance and hip hop acts to the heavy end of rock ‘n’ roll present unique challenges for the hallowed hall and its audiences: most notably, the fixed nature of the orchestra seating. Enter the game-changer of the revitalization project: a state-of-the-art deployable seating system. "Accessibility will be massively improved; It's a total step change." 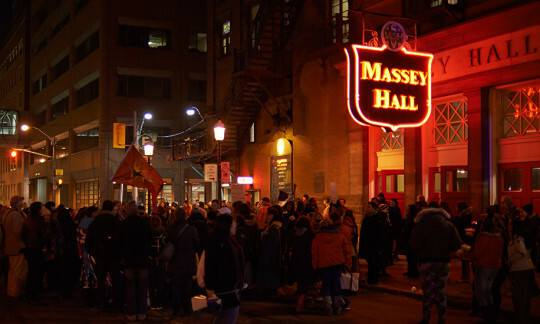 “The ability to transform the orchestra level into a standing room audience means a whole new category of acts will be attracted to Massey Hall,” explains Clemeth L. Abercrombie, senior consultant at Charcoalblue, the theatre consultant company behind the renovation. For general admission shows where dancing is irresistible, the ground-floor seats will come out. For concerts better suited to attentive listening, the seats return. These enhancements of patron experience aren’t limited to the main hall either. Seating will be updated and increased in the balcony, and the existing gallery seating will be entirely refurbished. And for anyone who has made that mad dash from the basement to the upper levels at the end of intermission, the welcome news is the inclusion of additional bars, plus additional washrooms and lobbies on every floor. Another welcome innovation is the installation of a parterre, a raised stage-facing seating area around the perimeter of the hall. 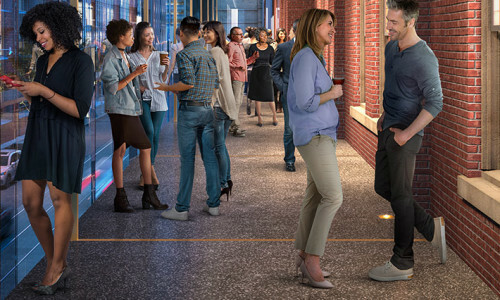 It will not only provide patrons with a seated option during general admission shows but, due to its height several hundred millimetres higher than the orchestra-level floor, patrons will be “floating” closer to stage level, enhancing their connection to what’s happening onstage. Most striking is the addition of a passerelle – a highly visible glassed-in extension running around the venue’s perimeter – that will be hung from the existing masonry walls to allow for patrons’ increased circulation through the space. Designed by architects KPMB and GBCA, the passerelle preserves the structure of the heritage building while allowing patrons move from one end to the other with ease. “Accessibility will be massively improved; it’s a total step change,” says Abercrombie, adding that the plans go well beyond the minimum Ontario building code requiring three per cent of venue capacity be reserved for wheelchair positions. Currently the hall can accommodate patrons in wheelchairs or those who use walkers or scooters via its advance seating service, but this has been limited to a handful of seats at the rear of the orchestra level only. While some patrons do enjoy the novelty of quirky ground-floor chairs that tilt backwards when you do, these almost 70-year-old seats are among the aspects of Massey Hall that currently don’t work so well for everybody. Avid concertgoer Jeff Harris, who has been attending shows at the venue since the 1980s, uses crutches as a result of a paralyzed left leg, and also suffers from chronic pain. “I enjoy Massey Hall because I know that if I get a seat on the main level, I will have a good time,” he says. But if seated anywhere else in the hall at the present time, especially the steep balcony and gallery, he risks falling or being unable to see the stage. He says Massey Hall is one of the few music venues in Toronto he patronizes, and that’s due to the guarantee of seats. But the current location of the washrooms and bar in the basement, down flights of stairs that get crowded during intermissions, makes an experience he adores still challenging. Like Harris, Massey Hall patron Maria Mete is excited about the music institution’s big reveal. In her experience, almost no venues in the city offer a comfortable setting for a person of size to take in live music. When attending shows at Massey Hall, she does her best to get aisle seats so that she can stand or take a walk if she has a flare-up due to chronic pain. Mete is encouraged to see an older, well-established heritage venue keep the issue top of mind within its revision plans. “I feel like the accessibility conversation has started, and I’m especially seeing change within more do-it-yourself-type and larger, corporate spaces with the means,” Mete says.